Well, after one month of staying away from my Passap machine I decided to do something so I would not forget how to knit. You’re laughing…don’t , it happens. This is afghan B1B in series 3 of Lydia’s afghans. So, this afghan was going to be my “Shades of Grey” afghan until I took the three cones of grey into my knitting room and discovered that two of them were the same color. Oh gosh, is my eyesight going now? The colors are slate grey, light grey and dark navy .The navy looks like black. I started the afghan and reached row 452 when I saw that there was a mistake in the knitting. First I went and looked at the pattern on my computer and it was right. Then I figured out what row the mistake was on. I dropped the piece from the machine and started again. When I got to the same row I watched the front bed pushers and sure enough, three came up that were not supposed to be there. I was leary of the pattern now so I watched on every row where color one was for the diamonds. I ended up finding a mistake further along and took that pusher and put it out of pattern. Then I found another mistake on color three on another row. I noticed twice that needle 52 was coming up a couple of times. I changed the pusher. It happened again later . Then when I was around row 850 I did not have any more problems. I knit 1393 rows. So, what caused the problem? There is no static electricity in the room I knit in. The room is on the cold side so was the console acting up? Is it the file? Is it the pushers ? Or is my machine like the car Christine and taking revenge on me since I have left her alone so long? Yep, I think that’s it! The afghan came out perfect and I don’t see any more mistakes. If you look 2/3 of the way up the afghan, there are two diamonds with a totally different design. This is not a mistake. The afghan starts on the middle of that design! Weird. 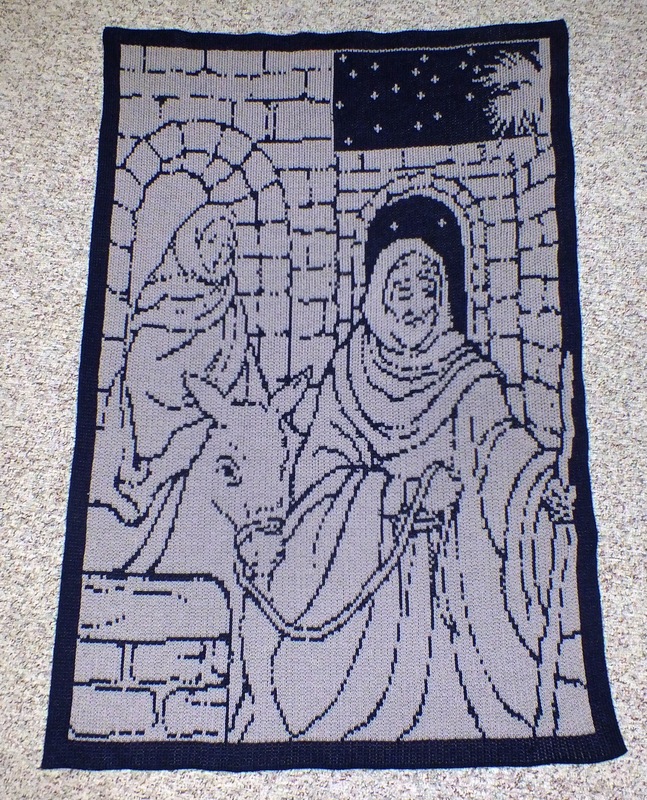 You won’t believe how I came to knitting this pattern. A magazine came in the mail and this picture was in it. I usually scan them and work from there with three programs. I had my camera handy and decided to take a close up picture of it. I did that and then I opened my picture manager and cropped it so I had just the picture. I opened it in win/crea and the size came out 178 stitches by 230 rows!!! The only thing I had to do was make sure the borders came out even. 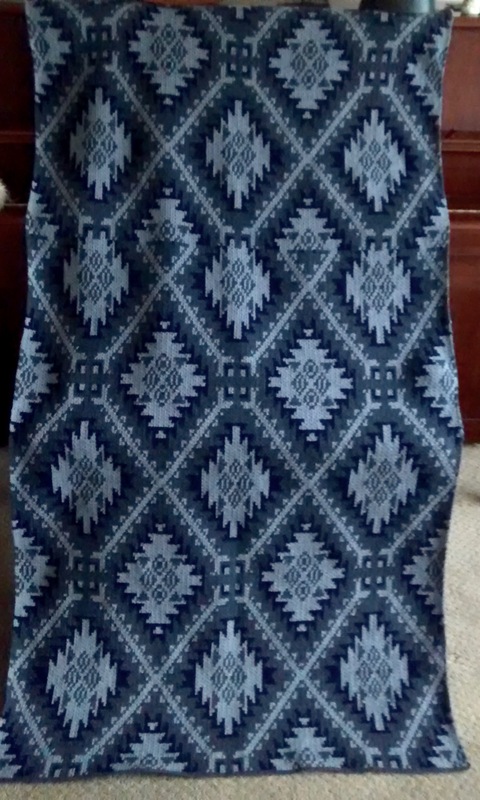 I had nine stitches in navy on each side but when I did up a swatch the sides looked a little wider than the bottom so I changed a navy column to light taupe. I also had to correct some of the stars and that was it. I love how his staff goes into the side border. Oh, I also took it into win crea to reduce colors but when it went to two colors, the pattern was lost. I took it into DAK and used four colors. One color was black and two were light pink and one was white. So I changed the light pinks to white and this is what I came up with. 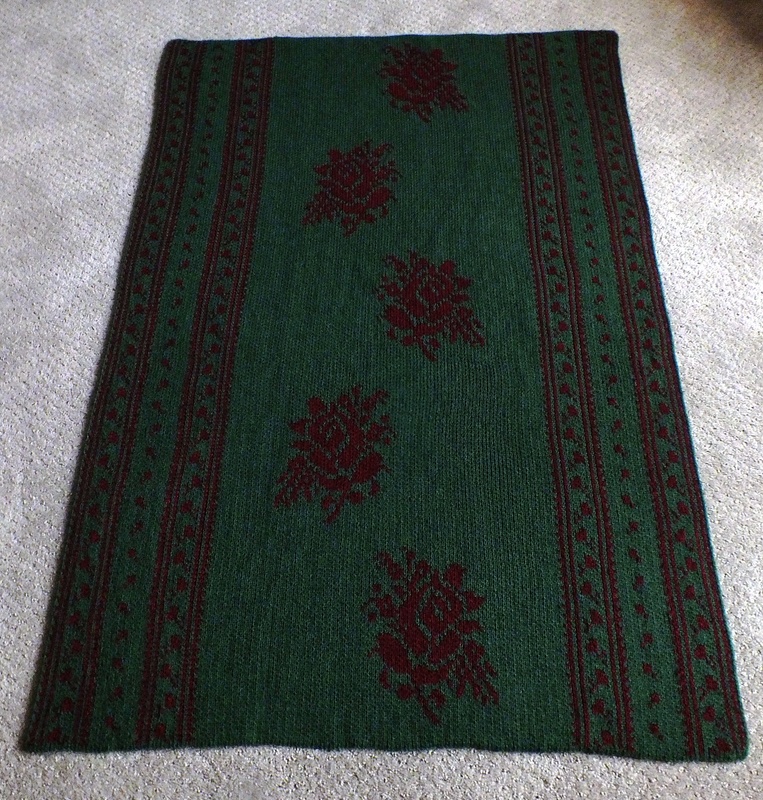 I wasn’t going to make afghans but I just had to knit this up. I used a dark navy and a light taupe. This was the easiest conversion to a knitting pattern that I have ever done. I am going to try to do this with a photo and see what happens. I used technique 187 . Here is my drop box link for the pattern also. Please try this first. If you have trouble email me at jccc7061@oh.rr.com. It is too hard to attach files out of wordpress.